The injury bug seemed to be going around NFL stadiums this week as star after star went down with injuries. Robert Griffin III will likely miss the rest of the season (or most of it anyway) with a dislocated ankle. DeSean Jackson, Jamaal Charles, AJ Green, and Knowshon Moreno all left the field with various injuries. Some players stuck out in good ways, and others in bad ways, prompting this weeks edition of studs and duds. Aaron Rodgers saw his Packers down 21-3 halfway through the second quarter to the Jets. He led the charge in what was a wild comeback, throwing for 346 yards with three touchdowns, good enough for 27 fantasy points in ESPN standard leagues. Kaepernick threw three interceptions and looked like he was trying to force passes, resulting in a tough loss at the hands of the Chicago Bears. He’ll try to bounce back in Arizona next week. Brandon Marshall was a game time decision headed into the Bears Sunday night contest in the inaugural game of Levi’s Stadium. Marshall hauled in three touchdowns on the most ridiculous catches. Not much explanation needed here as Cassel chalked up four interceptions this week versus the Patriots. It’ll be tough to bounce back, as the Vikings head to New Orleans to face the Saints. Antonio Gates was back to his old self on Sunday, racking up three touchdowns. The trend may continue, but based on his inconsistency, I would keep an eye on him as a fantasy owner. Gronk was much of a disappointment this week. The Patriots tight end only lined up for 28 of their 67 snaps and finished with four catches for 32 yards. What can you say about this guy? The former Saint looked right at home in his new offense, scoring a huge game-tying 19 yard rushing touchdown. But it wasn’t his rushing yards (four carries for 26 yards) that were the story, but rather what he did with the ball in the air. 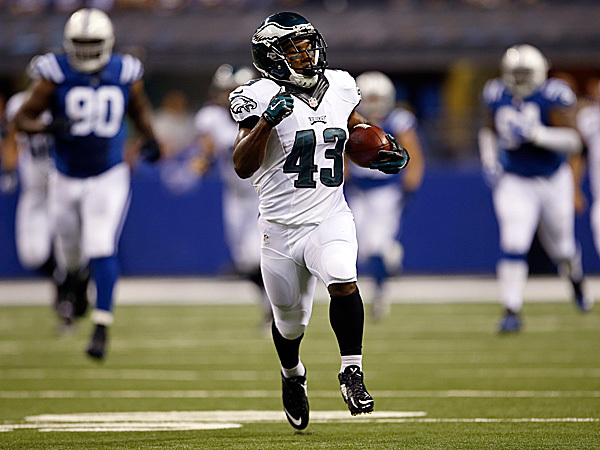 Sproles proved that he is still a threat when Nick Foles drops back to pass. Sproles had seven catches for 152 yards, which not only led all Eagles receivers, but led all receivers on Monday night. Coming in off of the bench cold after Robert Griffin III departed with injury was no easy task for Cousins, although it looked that way. He proved that he can lead Washington’s offense while Griffin is out. 250 yards and two touchdowns in route to a 41-10 win over the Jaguars, is something that Cousins should be very proud of. We’ll see how he continues to play next week against Philadelphia.